To travel to outer solar system and eventually to the stars, we're going to need some big breakthroughs in propulsion, protection from cosmic radiation, and more. Our Cosmic Concepts series looks at the far-out ideas that will take us there. The vehicle circles Saturn's largest moon, Titan, skating near the cloud level. It opens a hatch and deploys a series of rods connected by cables, with a mission payload of scientific instruments in the middle, which descend toward the surface. Prior to impact, the rods and cables form up into a kind of tight, protective cage around the payload that will not only absorb the shock of landing, but also take on the extreme terrain of this bizarre place, allowing scientists to explore vast swaths of the surface of Titan. The concept is called the Super Ball Bot, and if NASA robotics scientists Vytas SunSpiral and Adrian Agogino are right, the probe could become a new model of future robotic explorers capable of going where rovers and stationary probes cannot. The proposal is one of six that was awarded funding through the NASA Innovative Advanced Concepts Program for 2013. The NIAC funding provides two years during which Agogino and SunSpiral can refine the components and controls, and can be thought of as a feasibility study of the technology. Obstacles such as rocks or soft soil, the kind of problems that doomed the Mars Spirit rover and trapped its twin, Opportunity, for more than a month, can't stop the structure. It doesn't have wheels in the traditional sense. Rather, the probe is one giant wheel capable of bounding along the surface, with the added capability of using its rods to push and pull itself out of complex terrain—and even walk as needed. This is all accomplished by controlling the cables to change shape and create motion. 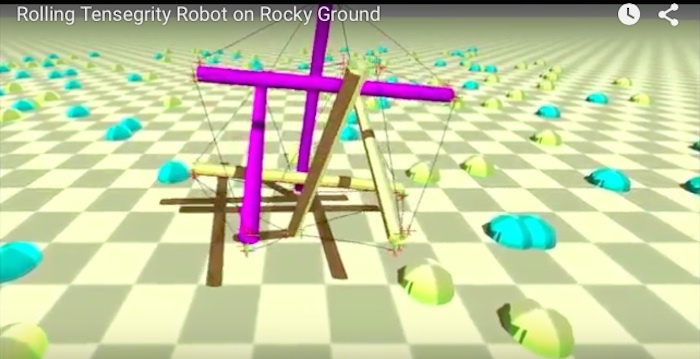 Super Ball Bot works on a concept known as a tensegrity structure, and SunSpiral and Agogino's design draws a little inspiration from futurist Buckminster Fuller and artist Kenneth Snelson. SunSpiral compares the mechanics of tensegrity to a skeletal structure. Rather than having rigid connections, such as a wheel on an axle, the ball's network of rods and cables is under tension but has no rigid hinges, and the components are free to move relative to each other. "They're under compression, they're being squeezed, they're doing their job as rods, but they don't touch each other, so the way that force propagates through the tensegrity structure is very different," SunSpiral says. "Forces diffuse through it, and they have some very interesting properties, because tension elements behave very differently. 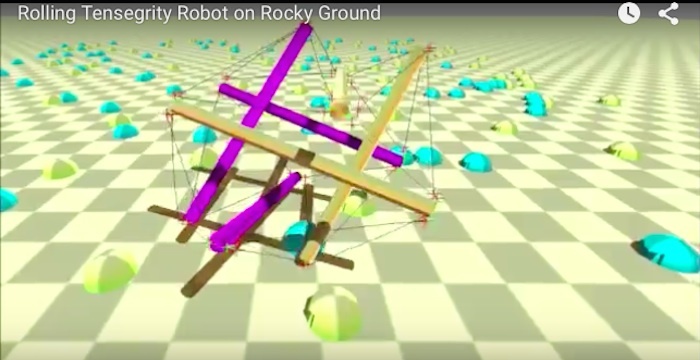 You don't have lever arms in them, so you get a lot of neat qualities such as this very inherent compliance and flexibility in the structure that is exactly what you need in a robot that's really going to interact with the real world." The structure itself allows for 50 percent of the mission weight to be devoted to the scientific instruments, compared with 22 percent for the Mars Science Laboratory (Curiosity). Because the rolling bots can stow in a compact size, the team envisions having the ability to deploy a few at a time. And since the structure itself protects the payload from impact, the cost for a potential mission is reduced—engineers don't have to rig up a complicated soft landing à la Curiosity's 7 minutes of terror. SunSpiral and Agogino have been doing experiments out of a high school physics class—dropping the spheres from three stories up with an egg inside to see if it breaks—hoping to simulate terminal velocity the spheres would encounter landing on Titan. With NASA's planetary science budget dwindling, cost savings matter. The agency's Discovery program already bypassed a poetntially awesome Titan mission in favor of sending another mission to Mars. "When you think of how a traditional robot works, you have these powerful motors, you grind away, you go somewhere and you don't get back any of the energy, and when you stop, you waste more energy again," Agogino says. "Instead, a heck of a lot of energy can be stored in a tension network. When people move forward and back, we give energy, we take energy. These compliant robots can really just kind of oscillate and bounce into place, so they're really fantastic." The two engineers have been using Titan as a target for potential missions because of the moon's incomparable terrain. It's one of the few places besides Earth known to have a thick atmosphere and liquid lakes, though it replaces water with hydrocarbons. The uncertain terrain makes it a challenge for rovers, with potential mud and other physical terrain not found on drier surfaces such as the moon or Mars. The biggest technical obstacle for Super Ball Bot might be the controls. As it's not a traditional wheeled structure, an entirely new set of controls were needed to ensure that each component of the structure crawl the way it's supposed to, moving the structure along. (See the below video.) The ball walks with each rod just as much as it rolls, hewing closer to biological locomotion than traditional rovers—and with that comes the need for fine motor skills. 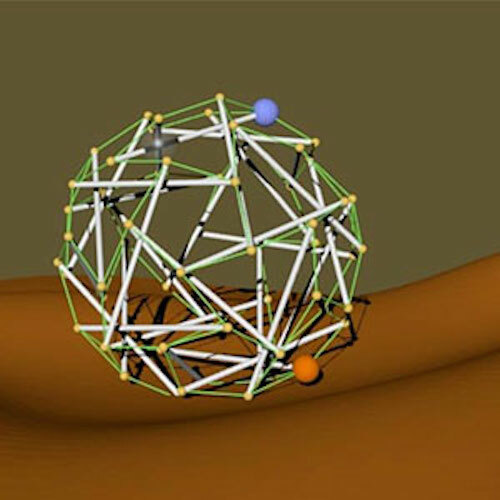 "If you had tried to invent the Super Ball Bot in the 1990s, you just wouldn't have been able to do it," Agogino says. "The control theory wasn't there, the machine learning wasn't there. The biologically inspired control theory just wasn't mature enough. So, sure, you'd have built the ball, but it wouldn't have done anything you wanted it to do back then. But now we finally have control theory to match the hardware, which is really fantastic.